The road your Christmas tree traveled from the land to your home is probably much different from what you imagine. Christmas trees, as evergreens brought indoors, may have originated from the northern European celebration of the winter solstice. Select a fresh tree. The needles should be moist and not break when bent with fingers. Store your tree out of direct sunlight and away from drafts. Immediately before the tree is brought inside, make a half-inch fresh cut from the trunk and place it in water. Use a Christmas tree stand that holds a gallon of water. Miniature light bulbs are better than large bulbs because they generate less heat. > At the darkest time of the year, evergreens provide a symbol of the continuation and renewal of life. An evergreen holds its leaves--or needles--for more than one year, so green leaves continue to grow while the oldest leaves die and fall away. According to legend, northern Europeans used evergreens in their Christmas celebrations as early as the eighth century AD. People used conifers, needle-leafed trees, most commonly, but broadleaf evergreens became holiday symbols in regions where conifers were rare-like holly in England. Today, the tradition of the Christmas, or holiday tree, can be found in most areas of the world. Until recently, most Christmas trees were cut from local forests. A long trek through the woods to find a good tree was a common rural tradition. Christmas trees also have been harvested as thinnings from young, planted forests. However, "wild" trees tend to grow irregularly, and even in planted forests only a small fraction of trees may develop into the shape most people consider good for a Christmas tree. Today, most holiday trees are grown as a specialized crop on farmland. 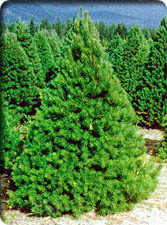 Christmas tree farmers plant particular strains of trees for attractive foliage or other special features. For good quality trees, weeds, insect pests and diseases must be controlled, and the trees must be sheared for several years to yield a high number of trees with the desired form. It usually takes 7 to 12 years of care to grow a good 7-foot Christmas tree in New York; some trees may take longer. Growing Christmas trees can be a good part-time business or hobby for owners of suitable land, if the grower can provide the skilled care required. Many more trees are planted than are harvested as Christmas trees. Christmas trees increasingly are grown, like other commercial products, as a business to allow tree prices to compete in interstate and international markets, especially in sales to large urban areas. As with other agricultural produce, an advantage of buying from local Christmas tree farms may be less a price savings than the opportunity to honor older traditions by having closer contact with the growth and harvest of your tree. Several tree species from diverse regions are grown as Christmas trees. Among the longer-needled pine species, the most common is Scots pine, native to many areas of Europe; less common is the white pine, native to New York. The common shorter-needled species include Douglas-fir from various regions of western North America, white spruce from northern U.S. and Canada, Norway spruce from Europe, and the "true firs. " True firs include our native balsam fir, Fraser fir from the southern Appalachians, and white or concolor fir from the West. People choose a Christmas tree species depending on tradition and individual taste. Each species has a distinctive appearance and fragrance, and some people prefer a tree densely sheared to a conical shape, while others prefer a looser, more natural form. Species vary in their normal retention of needles after cutting. Most spruce and true firs tend to drop some of their older needles after cutting, while pines tend to hold their older needles well. But all cut Christmas trees in a healthy, fresh condition should hold their outer, current-year needles well. For trees harvested some distance from the market, "freshness" depends on their care after harvest. At temperatures above freezing, a fresh tree should have flexible needles and the distinctive fragrance of the species. It is harder to determine the freshness of trees when outdoor temperatures are below freezing, so the reputation of the seller is important. When brought inside, a Christmas tree should readily take up water and transpire it through its leaves. To help the process, you should cut at least 1/2- to 1-inch off the base of the tree trunk and, initially, put hot water in the tree holder to remove any sealing pitch. It is important to keep the tree watered at all times because a fresh, well-watered tree will not burn easily. Under favorable conditions, Christmas trees should last inside safely at least a few weeks. When a tree ceases to "drink" water, it should be removed from the house. All Christmas trees, even species that hold their needles well, are dangerously flammable when dry. Although Christmas tree growing uses forest tree species, it has become more closely related to other types of farming than to forest growth. New York and other areas have surplus agricultural land. On these lands, tree farming provides an economic means of maintaining some land in an early stage of open conifers between farmland and forest cover. Several wildlife species prefer this "in-between" habitat. Christmas tree growers, like other farmers, need to be sensitive to potential environmental problems in the use of pesticides and other cultural practices. Also, Christmas trees, especially when grown locally, use less energy from fossil fuels than artificial trees. Artificial trees generally have to be re-used for many years to reduce their environmental costs to near those of natural trees. trees up for mulch that will eventually recycle to enrich the soil. Otherwise, by using smaller trees, people may reduce disposal and other environmental costs. Rooted, "live" trees, briefly brought indoors in pots, are sometimes suggested as an environmental alternative to cut trees. However, the environmental costs of handling a live tree may be more than for a cut tree. And live trees generally have a poor survival rate when transplanted during the winter. It may be wiser to use a cut tree, and buy rooted trees at the optimum planting season in your area. Grown with sensitivity to environmental concerns and with proper care and watering in your home, today's Christmas trees will provide much enjoyment through the holiday season, and, as in times past, point the way to a greener spring. Text prepared by Norman A. Richards, Professor of Silviculture, Department of Forest and Natural Resources Management. Richards has been growing Christmas trees as a hobby-business since 1955. Douglas fir and white spruce photos courtesy of the Ministry of Forests for the Province of British Columbia. The balsam fir photo is courtesy of Weir Tree Farms, Colebrook, NH.